Mr. McClellan’s story is similar to thousands of other stories from across Ohio. 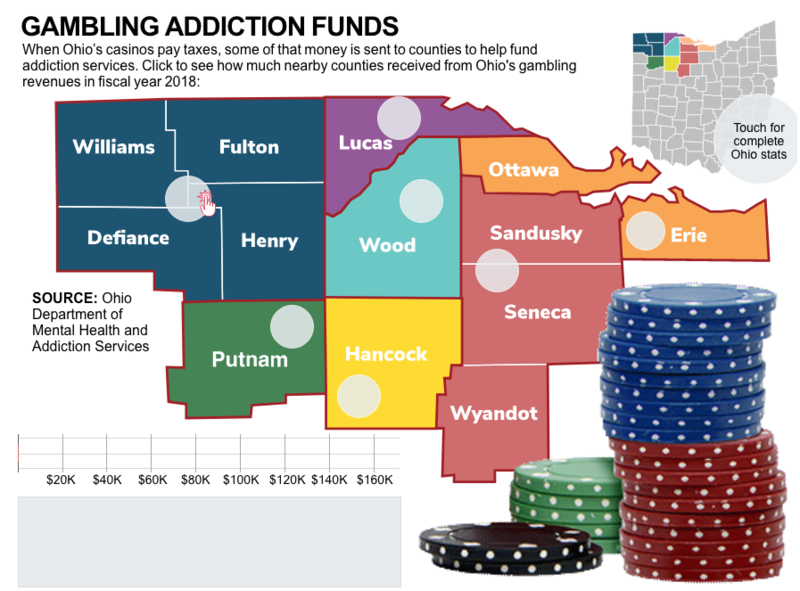 More than 76,000 people — or nearly 1 percent of the state’s population — admitted to struggling with a gambling addiction last year, according to data from the Ohio Department of Mental Health and Addiction Services. It’s a problem that predates the rise of Ohio’s casino system following the passage of a state constitutional amendment in 2009. And while Ohio’s casinos may have made gambling more accessible, they’re also required by law to generate much-needed revenue — totaling $30.4 million as of March, 2018 — to fund gambling addiction treatment services. Without that revenue, experts said, organizations that help gambling addicts would receive even less funding and would help even fewer people. Steve Kapela, a gambling addiction counselor who works at the Toledo-based Zepf Center, said that, as it gets easier and easier to gamble, the prevalence of problem gambling will likely grow. Unless the legislation that distributes a small part of the casinos’ tax dollars to local treatment and prevention programs expands to include activities like online gambling, services intended to treat gambling addiction before more lives are ruined will be overrun. Gambling addiction, Mr. Kapela believes, is as destructive as crack cocaine addiction. “If not more so,” he said. Compared to the billions of dollars in public funding earmarked for drug and alcohol treatment each year, gambling addiction services received just $73 million nationwide in 2016, said Keith Whyte, executive director of the National Council on Problem Gambling. “We are criminally underfunded,” he said. In 2016, 10 U.S. states reported no public funding dedicated to gambling addiction treatment, according to a survey conducted by the Association of Problem Gambling Service Administrators. Between 2013 and 2016, eight states cut funding to services, and one, Arkansas, eliminated funding completely. Mr. Whyte estimated that about 2 percent of the adult U.S. population — or about 6 million people — is affected by problem gambling. “At the end of the day, this is a national public health issue,” he said. Of the states that do provide public money for gambling treatment, funding per capita in 2016 ranged from less than $0.01 in Virginia to $1.46 in Delaware, according to the APGSA’s latest data. Ohio’s per capita funding was $0.55, putting it in the top 25 percent of the country. But gambling addiction still persists. Mr. McClellan, 35, grew up in Fostoria and left home at 21 to join the Army. He served for seven years, including three tours overseas in Iraq and Afghanistan. He said he returned home with post-traumatic stress disorder from his time in the military and moved into his parents’ house. Technically, he said, his first gambling experience was playing nickel poker with his grandmother on Thanksgiving at 8 years old. But his addiction truly started with drinking. Dual addictions are common in problem gamblers, said Mr. Kapela, who serves as Mr. McClellan’s addiction counselor. They’re like the game Whack-a-Mole — one goes away, and another pops up. Mr. McClellan gave up drinking in 2010. But his gambling problem persisted until last year — July 29 marked his one-year anniversary without placing a bet. During the decade between 2002 and 2012, five treatment sites for problem gambling operated in five Ohio cities: Cleveland, Cincinnati, Youngstown, Athens, and Toledo. Since 2012, when three of the state’s four casinos opened, more than 80 treatment centers have opened, said Stacey Frohnapfel-Hasson, chief of the Bureau of Problem Gambling Services within OMHAS. Under Ohio law, 2 percent of the tax revenue paid by each of the four casinos is distributed to counties statewide. The funds are allocated among counties based on population and are required to go toward addiction treatment for drugs, alcohol, or gambling. As of March, 2018, $30.4 million has been collected and distributed from the casinos’ tax revenues since the facilities opened, according to OMHAS records. Those funds are sent to counties’ local mental health boards, Ms. Frohnapfel-Hasson said. The boards then decide how to spend the money within their jurisdictions. In Lucas County, the Mental Health & Recovery Services Board gives all of its portion of the casino money — about $143,700 annually — to the Zepf Center, a nonprofit that provides mental health and addiction services and counseling. 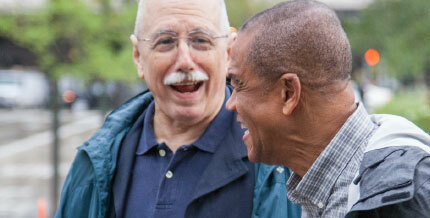 That’s where Mr. McClellan receives treatment service and works with his counselor, Mr. Kapela. Scott Sylak, executive director of the county’s Mental Health & Recovery Services Board, said Zepf is the only entity in the county with licensed counselors providing treatment for gambling addiction. It’s possible that communities in closer proximity to a casino, like those in Lucas County, are more likely to have a higher population of problem gamblers than other communities, Mr. Sylak said. He would like to see the casino money redistributed based on evidence of need but also pointed out that Ohio as a whole would benefit from a greater revenue stream for treatment services. “We definitely could use more resources across the state,” he said. Marilyn Rule, director of gambling treatment and prevention at the Zepf Center, said gambling is so much more accessible than it was in 1974, when the Ohio lottery began. It’s even more accessible than it was 10 years ago. During Zepf’s fiscal year 2016, the center’s gambling program served 51 clients, Ms. Rule said. During fiscal year 2017, it served 105 clients. And during fiscal year 2018, it served 177 clients. “Every year, we see more and more,” she said. There could be many reasons for the increase, she said, including the program’s own screening process, which often identifies problem gamblers who came to the center for reasons that had nothing to do with gambling. Ms. Rule estimated that 85 percent of the gambling program’s clients are already Zepf clients. The Casino Control Commission, which regulates casinos in Ohio, provides information about problem gambling on its website, including a list of resources for problem gamblers. And state law levies a 33 percent tax on gaming revenues, which, in addition to gambling addiction treatment programs, is distributed to counties, school districts, and other local governments across Ohio. The CCC also runs a voluntary exclusion program that allows people to ban themselves from casinos for one year, five years, or a lifetime. As of July, 2018, 357 people from Lucas County and 3,074 people total are on the voluntary exclusion list. It’s the same list Mr. McClellan put himself on when he decided to never set foot in a casino again. Hollywood Casino Toledo is owned by Penn National Gaming, a company based in Pennsylvania that owns gambling and racing facilities across the country. Bob Tenenbaum, spokesman for Penn National in Ohio, said company officials recognize that problem gambling exists and try to provide customers with education and resources related to the issue. PNG maintains a self-exclusion list that would bar individuals from any facility it owns nationwide, Mr. Tenenbaum said. In Ohio, the Casino Control Commission works closely with the casinos to provide the public with information about responsible gambling. “Each of our casinos has its own program to deal with problem gambling,” he said. When asked if casinos had contributed to the rise in problem gambling since they opened in Ohio, Mr. Tenenbaum said that would be a better question for state officials. At Zepf, the gambling program consists of Ms. Rule, Mr. Kapela, and two interns. That’s not enough, she said. More counselors need to be trained to treat gambling addictions. Part of the problem, though, is that much of the general population doesn’t see gambling addiction as a real issue yet, Ms. Rule said. The suicide rate in gamblers is higher than the rate in every other addiction, she said. Divorce rates are higher. Child neglect is higher. Domestic violence is higher. “A lot of people who don’t know anyone who is a problem gambler don’t understand,” she said. While living with his parents after leaving the Army, Mr. McClellan played in backdoor poker rooms and underground gambling venues. He’d moved a woman from New York with him to his parents’ house; his gambling ultimately destroyed that relationship. For two years, he spent almost all of his income on gambling. Mr. McClellan has received disability pay every month since December, 2014, from the U.S. Department of Veterans Affairs, and for a long time, upon getting his check on the first day of the month, he would go straight to the casino. “By midnight on the first, I’d be broke,” he said. He knew he had a problem. He sought treatment through the V.A. in Ann Arbor. He was committed to a psychiatric facility for suicidal thoughts, twice. He went through a treatment program in Cleveland, twice. “In 2015, I walked out of Hollywood Casino Toledo, and I said, ‘I never want to go back in,’ ” Mr. McClellan said. He came to the Zepf Center for treatment in early 2016, and while he’s still in debt — somewhere between $15,000 and $20,000 — he’s doing great, he said. In April, he moved out of his parents’ home for the first time and into an apartment. He fills in when the pizza shop next door to his home needs a delivery driver. In July he was a panelist during the 32nd National Conference on Problem Gambling in Cleveland, somewhere he never would have seen himself just a year ago. Contact Kate Snyder at ksnyder@theblade.com, 419-724-6282, or on Twitter @KL_Snyder.